Beach morning-glories hang on tight so dunes don’t wash away. Life is tough for a plant on the beach side of a sand dune. The wind is always blowing, battering stems and leaves with salt spray or burying them under new layers of sand. The shifting mounds don’t contain much organic matter, so fertilizer is in short supply. There’s plenty of sun for photosynthesis, but no shade when rays get too intense. Although dunes typically form beyond the high-tide line, storms occasionally flood them with saltwater. Lo and behold, beach morning-glories actually thrive in this hostile environment. The vines grow fast, crisscrossing the sand with 20- to 30-foot runners. Take a seaside walk on a summer morning, and you’re likely to see them in bloom. The 2-inch funnel-shaped flowers, typical of the morning-glory family, tend to open early and close in the heat of the day. Two species are found on Texas beaches. Ipomoea imperati, known as beach or fiddle-leaf morning-glory, has white flowers with yellow centers. Its leaves are usually more long than wide, and may be fiddle-shaped, arrowhead-shaped or smooth-edged. Their leathery texture resists drying winds and damage from abrasive sand. Ipomoea pes-caprae, often called railroad vine, has deep pink or fuchsia blooms. This plant is also called goat’s-foot morning-glory (a literal translation of the species name) because of its wide, two-part leaves, which call to mind the footprint of a cloven hoof. Beach morning-glories aren’t just for looks. With their creeping growth habit and deep roots, they help stabilize dunes so that other plants can find footholds in the sand. Dune vegetation is key to preserving the barrier islands that protect the Gulf Coast. Neither species is unique to Texas. The white-flowered beach morning-glory grows in all Gulf states. It also appears in Hawaii, where it goes by the local name of hunakai (beach foam). Railroad vine, which prefers slightly warmer and wetter conditions, is found on tropical and subtropical coasts all over the world. 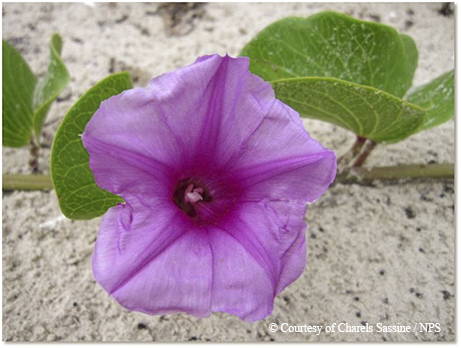 Along with stabilizing roots and showy flowers, beach morning-glories produce plenty of seeds, which can linger in the sand or ride ocean waves to new locations. If a hurricane rearranges the whole landscape, these hardy vines will be among the first plants to recolonize the beach. Sweet potatoes are members of the morning-glory family.